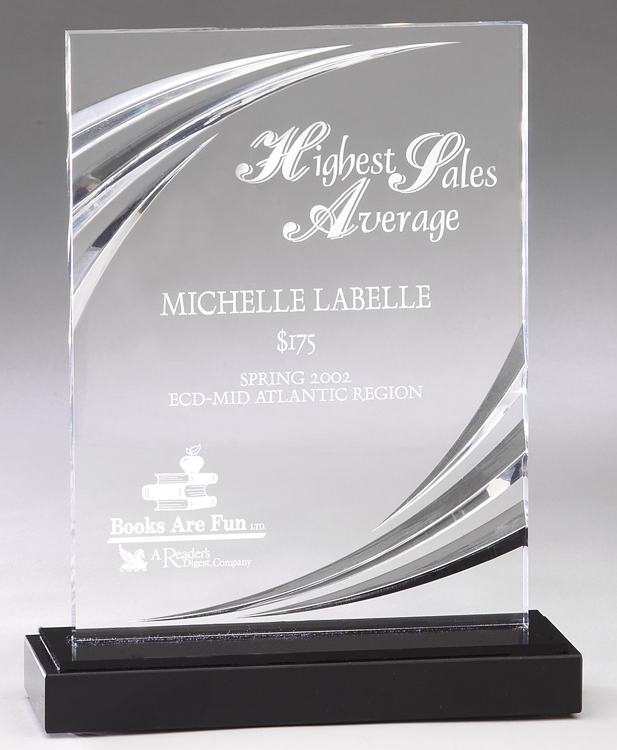 A contemporary styled award, our Nouveau Clear Acrylic Rectangle fits many situations where an award is deserved. DT60A possesses a simple, yet elegant grace, so it fits any office décor or home furnishings. The acrylic slab is vertically mounted onto an ebony base, and the face of the acrylic acts as the engraving plane. You may have a business logo, a slogan, and the name of the award placed here. Of course, the recipient’s name and the reason for the accolade will also be placed on the engraving plane. You simply tell us what to write, and our technicians will use our laser engraver to permanently etch your thoughts onto the award. We will fit up to eight lines of type on the rectangular plane. Need more room for type? You should order item DT60B that measures 6” x 8”. No matter which size you order, the engraving is free. Whether it is displayed in the office trophy case or at home in the den, this award gets the attention of everyone.